This is one of my favorite pictures of you. Nearly every day you spend time in this chair by the window reading. I love that you love to read. I love that you read cereal boxes, newpapers, fliers, road signs and even the tags on your clothes. 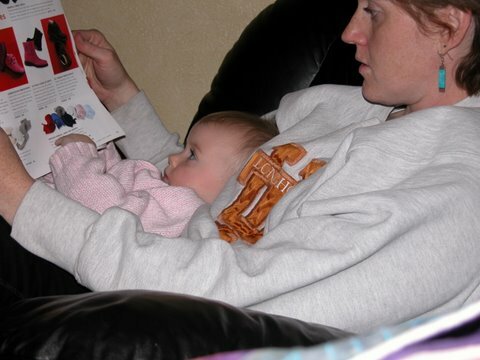 I love that you love to read aloud to me at night. Reading is a part of who you are . . . 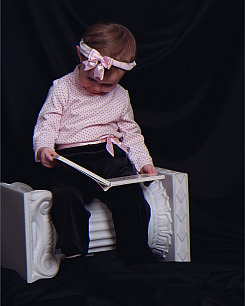 Such a part that we even had your portrait taken with a book somewhere along the way . . . 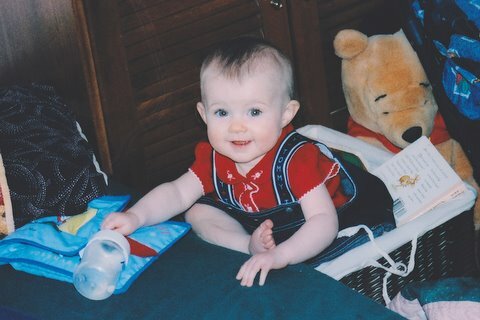 I vividly remember lying next to you on your mattress when you were just months old. (You slept on a twin mattress on the floor as an infant.) You were not yet able to roll over so you lay on your back staring at me as I read Margaret Wise Brown’s Runaway Bunny. I can so clearly recall your sweet little face and alert blue eyes. 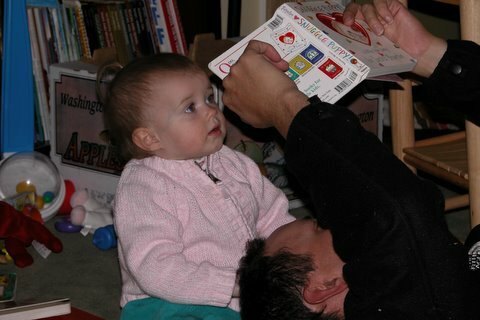 I knew your relationship with books was special when you were ten months old. I was cleaning the kitchen and was stricken with the momentary panic that comes over a mother when they suddenly realize they don’t know where their child is. I found you sitting in the book basket in your room studying your board books. You took to parking yourself there regularly for up to half an hour at a time. I think your fate was sealed when I got pregnant with your little brother. Between the nausea and exhaustion all I could do with you for five weeks was lie on the couch and read books. I put up baby gates and child-proofed the living room because sometimes I just could not keep my eyes open. We made it through those weeks by reading dozens of books a day. You especially liked Sandra Boynton’s BlueHat, Green Hat and Laura Numeroff’s If You Give a Moose a Muffin. Except we had to skip the “Boo!” page because it scared you. You really were not, however, particularly picky about what we read. 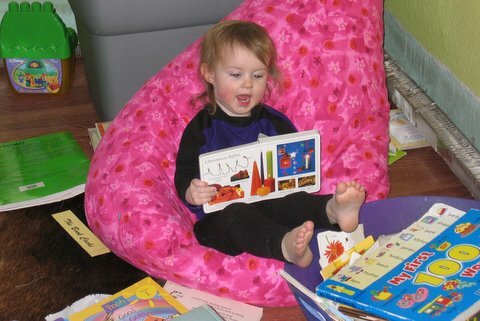 Shortly before you turned two you started “reading” books out loud to yourself. Using something resembling English and in your insanely high-pitched little voice you would rattle off the entire story as you remembered it. 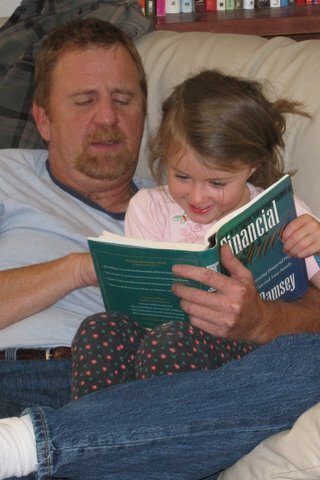 By the time you were three you were learning your letters and by four you were starting to spell. Remember when I had to ask you how to spell “story” when you were in first grade? I’m forever trying to put an ‘e’ in that word. You would always read anything within reach . . . or eyesight. And still do . . . which is why I have to check my email when you are in the other room now. 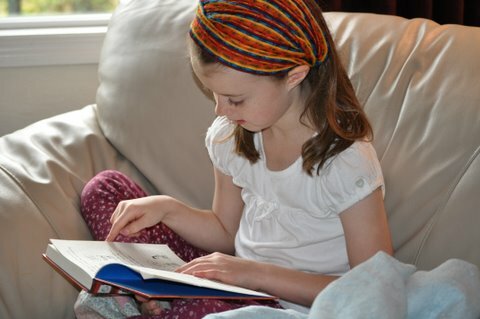 Words and language and books are your gifts, Roo. And it doesn’t hurt my feelings that you help me justify my book habit. I love you to your bones, girl-child, to your bones. 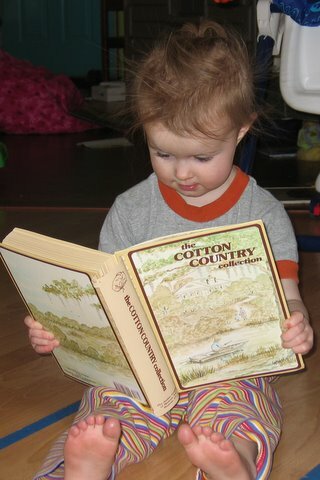 I love it that one of the books she is reading is a cookbook (Cotton Country Cookbook). Love it!! Sweet pictures, sweet blog….sweet Roo.